We already have talked about different ways to improve you speaking in English. We talked about top 10 tips to improve your speaking in English, moreover, improve your speaking using YouTube kids. In addition, mutual conversation is one of the best ways to improve your speaking in English. Just select what you like to talk about. Below is a list of questions for conversation (what would you do? 130 Questions). 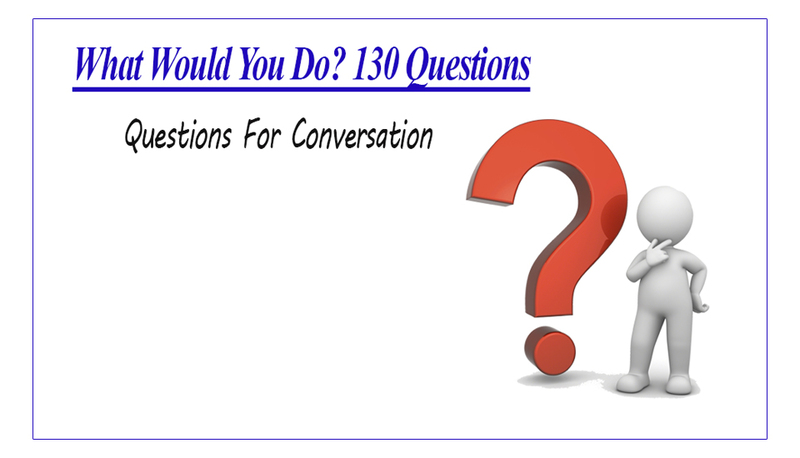 Just select a question and ask your peer keep conversation going and questions for conversation (what would you do? 130 Questions. 1. What would you like to do in the future? 2. What would you do if you were rich? 3. What would you do if you were poor? 4. What would you do if you were the principal of your school? 5. What would you do if you could suddenly speak English? 6. What would you do if you won a lottery? 7. What would you do if you were told you had one month to live? 8. What would you do if you were kidnapped? 9. What would you choose to have written on your gravestone when you die? 10. If you had only 24 hours to live, what would you do? 11. If someone’s underwear was showing, would you tell them? 12. If the whole world were listening, what would you say? 13. If one song were to describe your life, what song would it be? 14. If you bumped your car into another car, but nobody saw you do it, would you leave your name and address? 15. If you could be an animal, what animal would you be? 16. If you could be a bird, what bird would you choose to be? 17. If you could be a plant, what plant would you choose to be? 18. If you could be a super hero, which super hero would you be? 19. If you could be another person for a day, who would you be? 20. If you could be invisible for a day what would you do and why? 22. If you could change one thing in the world, what would it be? 23. If you could choose how you were going to die, what would you choose your death to be? 24. If you could choose to live on a different planet, which one would you choose? 25. If you could commit any crime and get away with it, what would you do? 26. If you could have only one food for the rest of your life (assuming that this strange situation would not affect your health), which food would you choose? 27. If you could hear what someone is thinking for a day, who would you choose? 28. If you could live anywhere, where would you live? 29. If you could meet any famous person, dead or alive, who would it be and why? 30. If you could speak any other language (besides English) which language would you like to speak? 31. If you could spend a day with any celebrity, who would it be and what questions would you ask that person? 32. If you could take a vacation anywhere in the world for any length of time, where would you go? 33. If you could go anywhere in the world for a holiday, where would you go? 34. If you could travel back in time, where would you go? 35. If you didn’t have enough money to get the bus home what would you do? 36. If you discovered a new island, what would you name it and why? 37. If you got arrested for murder, whom would you call with your telephone call from prison? And why? 38. If you had an accident and you had to be at home to recover for a long time, what would you do to relieve the boredom? 39. What would you do if you were at home at night alone and you heard a noise in your house that seemed to be footsteps? Would you stay calm or would you panic? 40. What would you do if you found the wallet of your next door neighbor who you hated? 41. If you could have any car you wanted, which car would you choose? Would it be practical or flashy? 42. If your car broke down on the motorway, what would you do? Would you try to fix it yourself? 43. If you could solve the problem of hunger in the third world or repair the ozone, which would you do? 44. If you could stop a bad habit that you have, what would you stop? 45. If you could go back to any moment in history, where would you go? 46. If you could be famous (a household name), what would you like to be famous for? 47. If you were on holiday and you lost your passport, would you know what to do? 48. If you were offered a job in another part of the country, would you be willing to take the job, assuming that the pay is very good? 49. If your partner were offered a job in another part of the country, which was well paid, would you be willing to change places? 50. If you were in the bank and somebody started to hold up the bank, what would you do? How would you react? 51. If you had one wish, what would you wish for? 52. If you could only listen to one song for the rest of your life, which song would you choose? 53. If only one book existed, which book would you like it to be? 54. If you could do any job, what would you like to do? 55. If you could move anywhere, where would you like to live? 56. If you found a suitcase full of $1,000,000, what would you do? 57. If you found a wallet with $1,000 in it, what would you do? 58. If you had 25-hour days (while everyone else continued to have 24-hour days), what would you do with the extra time? 59. If you had the opportunity to be different, what would you change? 60. If you had a time machine, where would you go and why? 61. If you had to choose, would you give up your sight or your hearing? 62. If you received lottery tickets as a gift at the office party, and you won $30,000.00, would you share the winnings with the person that gave you the gift? 63. If you saw a robbery, would you report it? 64. If you saw your zipper was down and people had noticed, what would you do? 65. If you speak two languages and your spouse (husband or wife) speaks only one, will you raise your children to be bilingual? 66. If you were candy, what candy would you be? 67. If you were a monster, what monster would you be? 68. If you were a toy, what toy would you be? 69. If you were abducted by aliens, would you tell anybody? Why or why not? 70. If you were American/Chinese/Mexican, how would your life be different? 71. If you were asked to choose which time period you would like to live in, which century would you choose? 72. If you were asked to speak to a graduating class, what would you say? 73. If you were given a chance to go to the moon, would you go? Why or why not? 74. If you were given a choice between being given great wisdom or great wealth, which would you choose? 75. If you were given an opportunity to be born again, in which country would you like to be born? 76. If you were given an opportunity to be born again, what kind of person would you choose to be? 77. If you were given one million dollars, what would you buy? 78. If you were given the opportunity to be born again, how would you change how you lived? 79. If you were given three wishes, what would you wish for? 80. If you were going to a deserted island and could only take three things with you, what would you take? Why? 81. If you were marooned on a desert island with one other person how would you survive? 82. If you were invited to have tea with the Queen of England, what would say? 83. If you were the leader of your country, what would you change? 84. If you were the President of the United States, what problem or concern would you work on first? 85. If you were told that you were going to die tomorrow, what would you do today? 86. If you were walking through the forest and you suddenly saw a tiger, what would you do? 87. If you woke up suddenly because your house was on fire, which three things would you save as you ran outside? 88. If you worked for a store and you saw another employee steal something, would you tell the manager? 89. If you saw someone in public with toilet paper stuck to their shoe, would you tell them? 90. If you could change one thing that you did that was bad, perhaps a crime or some wrong you did to another person, what would it be? 91. If you were told you had a terminal illness and had six months to live. What three things would be most important for you to do? 92. If your doctor told you that you had only one month to live, how would you use the time left? 93. What if you have to sacrifice yourself for the sake of saving your mother? What would you do? 94. If you could live perfectly well without sleeping, if you had no need to sleep at all, how would you spend all your nights? 95. If you had a chance to choose a poor (man/woman) as a (husband/wife) from you culture or a rich (man/woman) from another culture, which would you choose? 96. If you got into traffic accident, what would you do first? 97. If you could receive praise from a person, what person would it be? 98. What kind of praise would you like to receive? 99. If you were a color, what color would you be and why? 100. If you were a fruit, what fruit would you be and why? 101. If you could ask an All-Knowing Being one question about life, what would it be? 102. If you could have dinner with anyone (dead or alive), who would you choose, and why? 103. If you could live forever on earth as it is now, would you? Why or why not? 104. If you could have a free chip put in your brain so that you would automatically be able to speak and understand another language besides English, which language would it be and why? 105. If you were the Queen or King of Britain for a day, what would you do? 106. If you were the President of the USA for a day, what would you do? 107. If you had to spend 100 days on a desert island, what five things would you take with you and why? 108. If you were down on your luck, would you seek the advice of a palm reader? 109. If you lost your bathing suit while you were swimming, what would you do? 110. If you woke up one morning to find you had switched bodies with someone you know. What would you do? 111. If you could have any one supernatural power (flying, being invisible), which would you choose and why? 112. If you could say a sentence which the whole world could hear, what would you say? 113. If you were given a choice to live as long as you want, how long would you like to live? 114. If we could live for 300 years, what would the life be like? 115. If you were a famous film star, what crazy things would you ask for in your dressing room? 116. If you could stop time, what would you do and why? the earth. What would you do? 118. If you had the chance would you change something in history, risking that, your parents never will meet with each other and you never will be born? 119. What if your cell phone fell in the toilet, what would you do? 120. If you could only see three people for the rest of your life who would it be? 121. If you were an English teacher, what would you do to improve your students’ English? 122. If you could be famous throughout history for one thing, what would it be? 123. If you had to lose an arm or a leg, which would you choose. Why? 124. If you could be famous, but poor forever would you do it? 125. If you could know every language in the world, but you would never be able to use your native language again, would you? 126. If you woke up one morning in another country surrounded by people who spoke no English and with only the clothes you slept in, what would you do? 127. If electricity weren’t invented yet, how would your life be different? 128. If you could neglect one personal hygiene routine (shaving, brushing your teeth, cutting your nails, etc.) without any adverse effect to your image or health, what would you choose? 129. If you were to be killed, what part of your body would you donate and why? 130. If you went to the toilet and then discovered that there was no paper, what would you do?